The path to a healthy body and happy belly is paved with real food—fresh, wholesome, sustainable food—and it doesn’t need to be so difficult. No one knows this more than Kathryne Taylor of America’s most popular vegetarian food blog, Cookie + Kate. 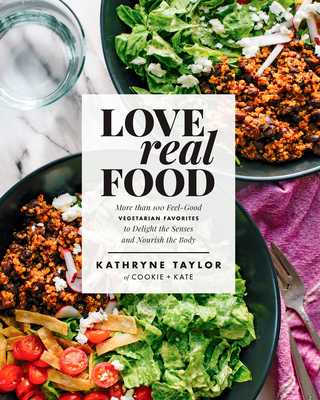 With Love Real Food, she offers more than 100 approachable and outrageously delicious meatless recipes complete with substitutions to make meals special diet–friendly (gluten-free, dairy-free, and egg-free) whenever possible. Her book is designed to show everyone—vegetarians, vegans, and meat-eaters alike—how to eat well and feel well. Kathryne Taylor is the personality behind the hugely popular blog Cookie + Kate, named after her crumb-catching dog Cookie. In six years, the vegetarian and all-natural food blog has grown from a hobby to a full-time project, and now garners over two million visits per month. Kathryne researches, develops, cooks, photographs, and writes every recipe on the blog. Originally from Oklahoma, she now lives in Kansas City.